THE CAMERA PLATFORM: It moves from back to front and from side to side, which allows you to quickly adjust the horizontal balance of the camera. By varying the amount of counterweight discs on the base platform, you adjust the camera's vertical balance. The camera can be quickly mounted and removed with the help of quick release. CARBON FIBER TELESCOPIC SLED: Telescopic, lightweight, durable and professional carbon fiber sled post. The sled extends to a maximum of 38cm, minimum of 27cm. GIMBAL SPECIFICATIONS: Wheelbarrow bearing provides rotational control over the camera, so it can be easily rotated on its axis. BALANCING THE CAMERA: The stabilizing system contains weights. The main function of these weights is to balance your camera on the stabilizer. You can add or remove weights as required. A Super-Strong and Lightweight Stabilizer This exquisite stabilizer weighs only 0.925kg, which is made of High-strength and lightweight Carbon Fiber. Carbon Fiber is the super hero of the materials world -- it is one of the strongest and most lightweight materials available on the market today. Five times stronger than steel and one third its weight. It has many advantages including long lasting durability and strength, used for Aerospace, Aircraft, Automotive, Sport Equipment, and Medical Equipment to name a few. Its versatility, strength, and durability make it valuable in many industrial applications. Keep Your Camera Balance Without a camera stabilizer, the image on a photo could be blurry and skewed due to movement during the image capture. Stabilizers help to keep your image crisp and clear when you're trying to capture a moving object or if you're taking photos without a tripod. It always can maintain your camera's balance and isolates it to counteract hand motions and reduce shakiness. Why Choose Us? Smaller, lighter, faster has become the industry trend in DSLR cameras and video camcorders. Light to hold, easy to operate,quick to set up, professional design of powerful capacity and high flexibility allows all-round stable shooting. 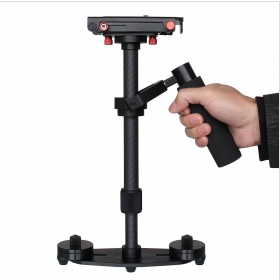 Nalanda Carbon Fiber Hand-held Stabilizer allows unrestricted booming and 360 degree panning. A no-tools-needed telescoping base, with adjustable weight discs allow you to achieve dynamic balance.